Once a month Chicagonow gives us a subject that we can write about. We have an hour and I haven't done it in a very long time. Tonight's subject, "write about something you believed as a child or in your youth that turned out not to be true". I had to participate. In 1965, I was in the first grade. I vividly remember arriving home from school to a house of sad faces. My father was home which was unusual during the day, and my mother had been crying. She sat my sister and I on our living room couch and proceeded to say "Poppy died this morning". Poppy was her father, my grandfather. Not having any understanding of death, I put my head down in my lap and pretended to cry. It seemed the right thing to do as my mother wept. I recall going upstairs to my room after this and not remembering what she had just told me. I went about my business, completely oblivious to what this meant. I was too young for funerals; too young to know or comprehend what happened and my parents never really explained it. It wasn't until the 8th grade that I would begin to understand. The day I figured it out is a day in my life that I have never and will never forget. I imagine I always have lived my life in a bubble; always looking at things through rose colored glasses. This of course meant that myself and my family would be together forever, that we were all invincible. And at the moment I realized that was not true, my life was irrevocably altered. It's hard to recall what exactly transpired after school that spring day in 1971. Something, somehow was said or done and as I boarded the school bus to head home, I suddenly understood death. My belief that my family and I would live together and alive forever was shattered. I rode the bus home in a complete state of anxiety and vomited when I arrived. This could not be true! My parents were not going to die! I was not going to die. Whatever that thing was that happened to my Poppy well, it had to be something different. As I let it sink in I realized it was in fact, death. I was facing mortality for the first time in my life. What I had believed to be true for 13 years was suddenly not so. I laid awake that night in bed counting on my fingers how many years until the turn of the century and how old my parents would be at that time. Dad would be 67, mom would be 66. That was young I thought, people live much longer than that. It gave me some comfort. The following early spring of 1972 my grandmother passed away. It was my mother's mother and the first time I would really feel the loss of a family member. I could not understand how my mother would survive with no parents and knowing that someday I would face the same situation, I felt unbearably betrayed by my youth and my beliefs of eternal life. 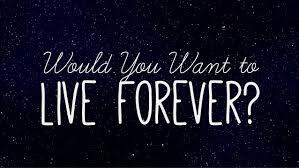 When my oldest daughter was around 5 years old, she began to ask me to promise I would live forever. It broke my heart as I remembered how I felt when I had my "awakening". I had to tell her the truth; I could not mislead her that I would not go someday. I promised that I would do everything I could to be with her as long as I could but that it would not be forever. I guess this is a bit different than learning Santa Claus wasn't real or that the tooth fairy wasn't really a fairy after all. But life offers many surprises and realities and we all must learn to accept them as they come. And try not to vomit when we figure them out.